If you’re looking for a solid chuckle on this summer’s twilight weekend, we’ve got it for you. On Wednesday, Boston magazine reported with a certain level of astonishment that General Electric chief technology officer Vic Abate was choosing to remain located in the Schenectady area rather than follow his company’s head office move to the Fort Point section of Boston. Thursday, Schenectady’s Daily Gazette responded with a cheeky blog post that backed up the wisdom of that decision. The [Gazette] piece does make a few valid points. 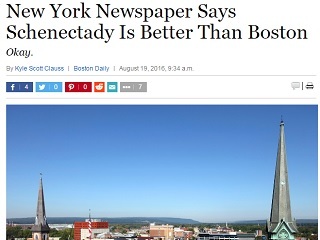 Real estate is much more affordable in Schenectady, and “Electric City” is an infinitely cooler nickname than “Beantown” – that is, if anyone here actually called it that. But Union College over Harvard? The Mohawk Hudson Trail over the Freedom Trail? Whatever they call their Italian enclave over the North End? Get real. Clauss goes on to joke that if there are indeed lobsters to be had in his city for 15 cents a pop, he’ll gladly treat his Daily Gazette counterparts to a seafood feast.